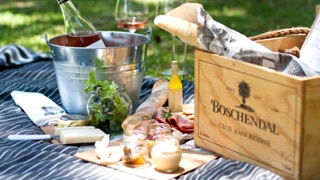 Picnics on the Boschendal Estate outside Franschhoek has long been the “in thing” to do during the summer months. Boschendal wine estate boasts some of the most picturesque views in the Cape Winelands, with dramatic mountain vistas visible from the lush lawns. So, it’s no surprise that the Boschendal Estate of Franschhoek has become a popular picnic spot as families, friends and lovers all come together for a day out in the Franschhoek wine region. Boschendal recently launched Two New Picnic Lunches that offer guests distinctly different experiences. There is one similarity – the food. Only naturally grown produce from the estate, as well as locally made artisanal goods are used ensuring guests receive a basket filled with delicious, healthy and wholesome food. The seasonal picnic menu do change depending on what our food garden is producing. The two picnic areas are 1km apart so be sure to remember which one you have booked. Our classic Boschendal picnic has relocated to the Rhone lawns – this is in the wine-making and wine tasting hub of Boschendal. The picnic area has spectacular mountain views and is surrounded by the exhibition vineyards, the Rhone Homestead, the Cellar Door and the Winery. Picnic baskets can be enjoyed at carefully laid out tables or on a picnic blanket under the shade of the oak trees. This is a full service area for guests. Under the trees of the Pavilion lawn is where you’ll find this picnic spot, next to the main werf and our farm-to-table food hub. It’s a more relaxed affair, with hammocks, bean bags and loads of space to spread out a blanket. We welcome our guests to bring their own blankets, chairs and tables to this picnic at Boschendal near Franschhoek. There is also a jungle gym and acres of garden for the kids to romp around in. Please send us an email using the link below for the seasonal times and rates.